Cub Cadet Challenger Side x Sides: Click here to view the models. Brinly Residential Lawn Care and Garden Attachments: Click here to view the models. Cub Cadet Pro Z L Series Lawn Mowers: Click here to view the models. Welcome to Zion ATV Adventures! Welcome to Zion ATV Adventures, your local Cub Cadet dealership. We are a family-owned store in Hurricane, Utah--just outside of St. George--ready to help you with all your outdoor needs for work and play. You'll find us one block north of IHC Instacare and the new Clarion Hotel. 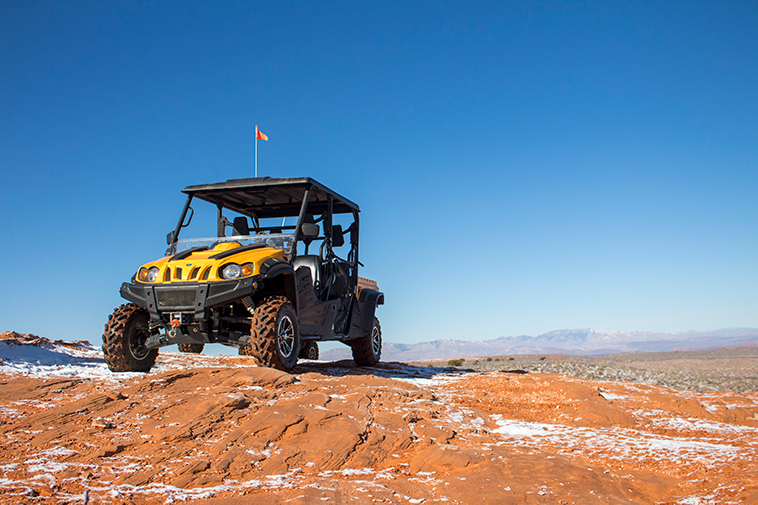 Zion ATV Adventures provides affordable Cub Cadet outdoor equipment and UTV's for outdoor adventures and work. Our side x sides are great for trail rides and ranch work, as well convenience for the weekend mountain camping trip. The 750 Challenger side x side is available as a two-seater and crew four-seater. It's an excellent machine for trail riding, farm/ranch work, and hunting at a very competitive price. Cub Cadet lawn and garden machines and power equipment are also in our showroom, from pressure washers to edgers to residential mowers and commercial mowers. Zion ATV Adventures is also your go to store for all your service needs and questions about your equipment. You'll find that our mechanic will help you honestly determine your repair needs. We are an authorized warranty repair center for Cub Cadet and Massimo, making it easy to maintain top performance. Our on-site mechanic also repairs other brands of farm, yard, and recreation equipment (including motorcycles) at our easy to access store right here in Hurricane. You'll feel comfortable coming to Zion ATV for your equipment needs. Besides affordable sales and personal service, Zion ATV offers a wide array of parts and accessories. Check out our catalogs to see what we have. If you need help in making your selection, call or stop in—we're always ready to help! We care about families at Zion ATV Adventures and want to be able to help your family as you work and play hard in our great outdoors. We are the place you can come to buy, repair, add accessories, and get questions answered about your outdoor machines and equipment. We understand the importance of your time, money, and safety. Come in to the store and meet Terry. See how Zion ATV and the Cub Cadet machines can benefit you. Founded on the idea that we can help the people like us, who love the outdoors and depend on access and their outdoor equipment for their livelihood, Zion ATV Adventures is ready to be your outdoor store. Call or stop by; you’ll be glad you did!